Use the drop-down menu below to explore Lake Como. Playgrounds of the rich and famous, the Italian Lakes in the foothills of the Alps are areas of outstanding beauty. Lake Como, where mountains plunge into deep waters, is the most breath-taking of them all. Boasting many cultural and artistic gems, Lake Como holidays are a fantastic way to visit northern Italy. The magnificent mountainous topography of the Italian Lakes varies tremendously from other Italian regions, with Lake Como surrounded by a rich and varied landscape with 18th century villas and luxurious parks magnificently rising up along the shoreline. Lake Como boasts the longest shoreline and is reputedly the most enchantingly romantic with a rugged beauty of soaring mountain peaks, gentle foothills and lakeside towns and small villages. It has attracted scores of composers, artists and poets from Verdi and Liszt, to Wordsworth, Shelley and Byron, plus the rich and famous including Pliny the Younger and George Clooney! Nonetheless, holidays to Lake Como can be best enjoyed with refreshing swims in the lake, boat cruises around the area and leisurely walks in the surrounding hills. Como Town, originally founded by the Romans offers a vibrant yet also relaxing atmosphere and is renowned for its wonderful Gothic-Renaissance architecture. With its fantastic lakeside location it is the ideal place for a day trip when on holidays to Lake Como. Visitors can enjoy leisurely walks around the local villa gardens or venture further to explore some of the mountain trails. Equally the towns of Bellagio and Menaggio enjoy a magnificent scenic position on the lake. Bellagio is situated on the tip of one of the lakes southern arms and boasts spectacular views of the surrounding area. 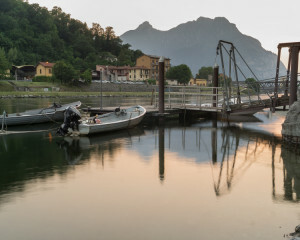 The resort of Menaggio is a great location for Lake Camo holidays with plenty of hill-walking and boat trips to be undertaken. The towns of Cernobbio and Tremezzo are also popular choices for those looking for sheltered shores and fabulous views. Close to Milan, especially Como Town which is only around a half hour drive away those on Lake Como holidays can also visit Italy’s culture capital. Famed for its trendy shopping and Gothic cathedral it is an excellent addition to holidays in Lake Como. Lake Como enjoys beautiful sunny days and a warm year round Mediterranean climate. The summer months enjoy particularly hot temperatures whilst the winter months are much milder. Getting to Lake Como is simple with many major airlines, including some "low cost" airlines, flying in to Milan from a number of regions across the UK and Ireland.